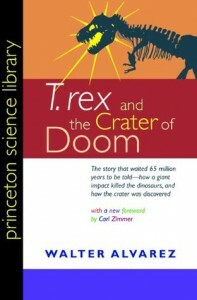 I'm still suffering from the effects of The Rise and Fall of Dinosaurs, but the one good thing that came out of reading the book was that it introduced me to Walter Alvarez' book T. Rex and the Crater of Doom. I originally DNF'd Brusatte's book but then went back to read different parts for comparison with Alvarez' book, only to find that I was right to DNF Brusatte in the first place. Anyway, Alvarez strikes a much different tone in his book, quotes and credits other scientists without derogatory commentary, and gives actual explanations of the science and thought processes that he based his work on. "The question was now precisely formulated: Did the clay bed represent a few years, or a few thousand years? It was also formulated in a way that would tell us something interesting about the extinction event: Were the limestone-producing organisms out of action for a few thousand years, or had there been a few years of abnormally rapid clay deposition? How could we answer that question? We needed something that had been deposited in the Scaglia limestone and in the clay bed at a constant rate, and then we could calculate the time represented by the clay bed. The year before, Dad had suggested that we use beryllium-10, formed at a constant rate in the atmosphere. Now he had a new idea of the same general kind—that the deposition rate of meteorite dust would be unchanging. Big meteorites fall very occasionally at random places, but fine meteorite dust from outer space falls constantly, as a very light sprinkling all over the Earth, and if we could measure the amount of meteorite dust in the clay bed and in the normal Scaglia limestone, we would know the time represented by the clay. But this is rare stuff! You don’t realize it when the occasional microscopic grain of meteorite dust settles on your hand or your head, and we knew of no way to extract meteorite dust from ancient sediments and weigh it. But there was a chemical approach. Dad realized that we could analyze the clay for one of the platinum-group elements.3 These elements are far from abundant in meteorites, but are present in quantities sufficient to measure. The Earth as a whole must have about the same fraction of platinum-group elements as meteorites do, because both came from the swirling cloud of dust and gas which condensed to form the solar system. But the Earth’s crust and sediments have much lower contents of platinum-group elements than meteorites do. This is because these elements are absorbed by iron, and the Earth has an immense iron core where the Earth’s allotment of the platinum-group elements must be concentrated. As a result, the sediments at the Earth’s surface are strongly depleted in them, to the point where they are barely detectable with the most sensitive techniques. We reasoned that meteorite dust, slowly accumulating over thousands of years, would be the main source of the platinum-group elements in the Scaglia sediments. If the clay bed had been deposited over a few thousand years, it would have had time to accumulate a detectable amount of platinum-group elements, but if it had been rapidly deposited in a few years it would be essentially free of these elements."